Are you one of those goal oriented types that forgets to look up from the grindstone once in awhile to stop and smell the roses? Perhaps it is time to not only look up but also unplug the freaking thing. Remember this⎯there are no replays here, and life will march on as they say, with or without you. Welcome to the 21st century where the new grindstone is technology. Since my brain is now connected more than ever, thanks to my smartphone, I am finding being connected at all times to be a brain sucking habit that takes over until you find yourself addicted to constantly plugging into something. This constant plugging in zaps my ability to think clearly. For all the wonderful things being plugged in provides, it seems to take more time away from what is truly important. Being one of those highly organized, goal oriented types, a smartphone seemed like a perfect fit for me. BUT like setting goals⎯goal is set, work like a dog to attain the goal, then what? Sometimes, many times, attaining “that” goal is not what I expected, and can be downright disappointing! Being connected all the time is not what I expected and is disappointing because it is such a time drain. It seems to speed up an already faster pace of life. ENOUGH ALREADY! This is not a place where happiness resides. Nose to the grindstone leaves us feeling empty and searching for something more, and that something more is⎯LIFE! This is true whether plugged in or not, but unless I unplug regularly I start to lose my sense of self, my place in the hierarchy of constant connection to everything but ME. So today⎯unplug yourself. Begin by taking 3 deep breaths and unplug for 5 minutes, then tomorrow unplug again and again until you can give yourself a day or a week of unplugged bliss. The idea here is to get into the habit of unplugging regularly. What does unplugging mean? No whatever it is you are normally plugged into! Go for a walk in a garden, nearby park or arboretum, perhaps even your own neighborhood! Unplugging⎯here is where you just might find the answers to the emptiness, the something more, the something that is truly important and missing in your life! 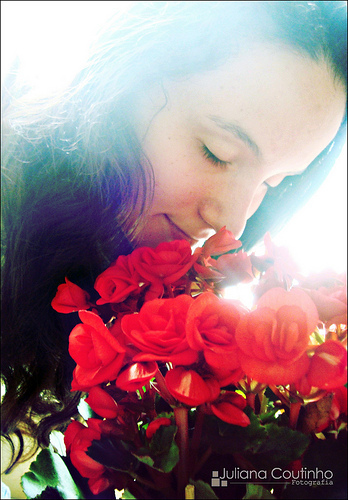 Stop and smell those roses and you may just find a new pace of life called happiness.